At Antun’s by Minar, we promise our clients the most superior event planning process. When you trust your event to the care of our highly experienced event planning staff, it is our guarantee that it will be a success. Our experts will sit with you one-on-one to make sure that we understand the full requirements of your event. 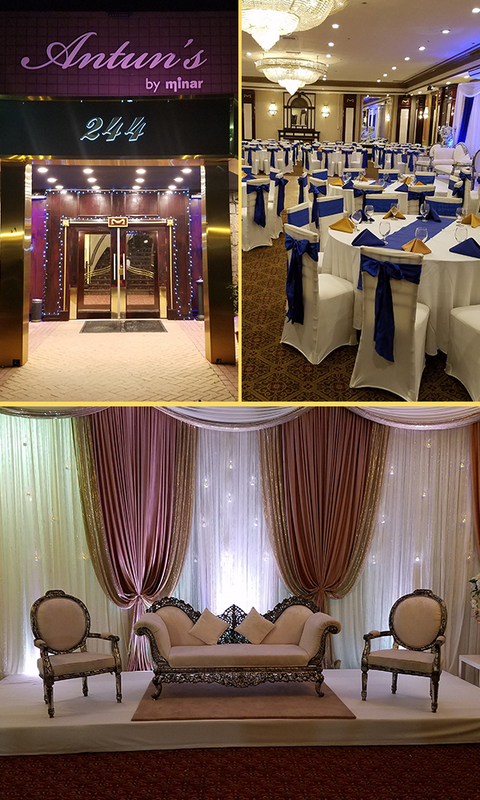 Whether it is a wedding reception, birthday party, mehandi, sweet sixteen, engagement party or any other type of event, we will plan and host you and your guests with class and style. We make all the necessary arrangements for your event from A-Z. From planning out your custom catering menu, to deciding which of our luxurious rooms to host your event, to booking the DJ, florist, and anything else your event requires- we will ensure that every detail is perfect. Our event specialists have catered to all different sizes of events, and have handled our clients every request. It is important for us to get an in depth understanding of the party you are trying to throw so that we can help you choose between our exquisite Lux Room, Hamilton Room and Ball Room. Depending on what your event requires in terms of dance floor, DJ, Video display, etc., our experts may recommend one room over another. Antun’s by Minar specializes in both indoor and outdoor catering. For your event, you will be able to choose between our exquisite South Asian, Spanish and Italian culinary creations that are sure to make you and your guest’s mouths water. We have many catering menus to choose from but we are also happy to customize your events entire culinary experience to suit any specific requirements or taste preferences that you may have. Antun’s by Minar promises quality, value, and service from our first meeting with you, until your event is a success.